It is available for commercial photovoltaic (PV) and concentrated photovoltaic (CV) installations. Although solar trackers can significantly increase the energy output of solar cells by keeping them optimally aligned to the sun, installing them on all the panels at an installation can add significant expense and provides multiple points of failure. 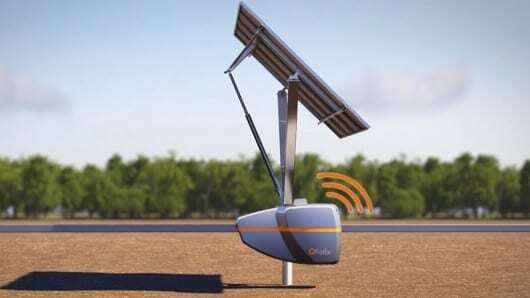 A new tracking system from QBotix avoids these problems by getting a robot to do the rounds of the solar installation throughout the day and adjust the panels at 40-minute intervals to ensure they are optimally facing the sun. The QBotix Tracking System (QTS) essentially takes the individual motors and controllers traditionally placed on each panel mount and replaces them with a pair of autonomous mobile robots – one primary and one back up. These “Solbots” contain the motors and controllers required to physically realign the panels and travel from panel to panel on a rail, adjusting each panel as they go. The tracks can be laid on ground without extensive grading required and the system is modular, so the tracks can be extended if more panels are added. QBotix says its Solbots are dustproof and waterproof (to IP-65 rating) and can monitor and operate a 300 kW solar array. However, the panels do need to be mounted on QBotix designed mounting system that is compatible with the robots. But the company says its trackers are compatible with all standard solar modules, inverters and foundation types used in ground-mounted solar installations. The trackers are also purely mechanical with no motors or electronic components, reducing the chances of a breakdown.